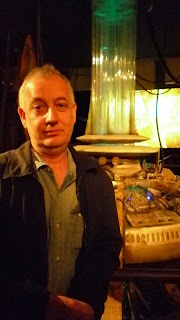 My birthday treat this year was a trip to see the Doctor Who Exhibition at Olympia. 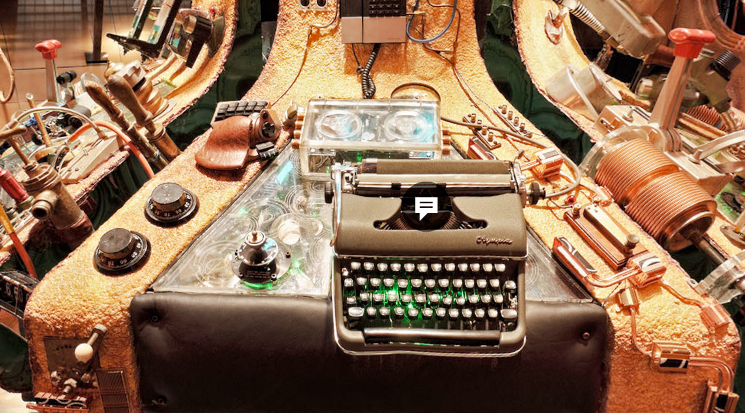 It is the first ever interactive Doctor Who exhibition. Divided into two sections, the initial part verges on a theme park ride whilst the second section is more of a traditional display of monsters, costumes and props. I think they have achieved a good balance between providing thrills and spills for the children and interesting objects for adults to pore over. Having worked on audio visuals for museums and exhibitions I know that this is not always the case. Often museums are so desperate to ‘get down with the kids’ and introduce new technologies that they end up dumbing down – they forget that the objects within them are, in themselves, exciting and that there is no substitute for the real thing. The first section is particularly fun to go around when there are plenty of children in the group. As a somewhat jaded ‘professional’ I could see how the tricks worked, but could also see how my ten year old self would have been absolutely blown away by it all. The reveal of the Tardis is one of the oldest tricks in the book (the old ones are still the best ones!) but it was great to see the astounded look on the kids faces as the Tardis ‘materialised’. 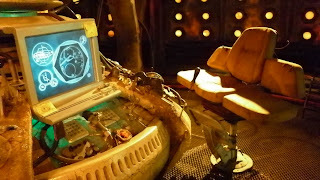 You do get to actually go through the TARDIS doors and into the console room. 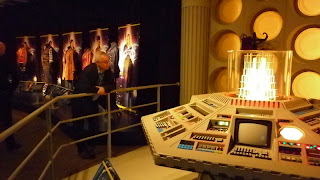 It’s not a faithful recreation of the TV console room (that would have required a lot more space) but it is bigger on the inside and it’s great to get up close to the console. The interactive section is quite short but you do get to become entangled in a war between the new Daleks and the old ones and experience a 3D section. This is very effective – it feels like the Cybermen are shooting directly at you and the Dalek eye stalk is right in your face! Older fans are likely to be just as excited about the final section – a more traditional display of props, monsters and costumes. This is very well laid out with two console rooms – the Ninths and Tenths and the 1980’s one (complete with moving time rotor), and lots of aliens. 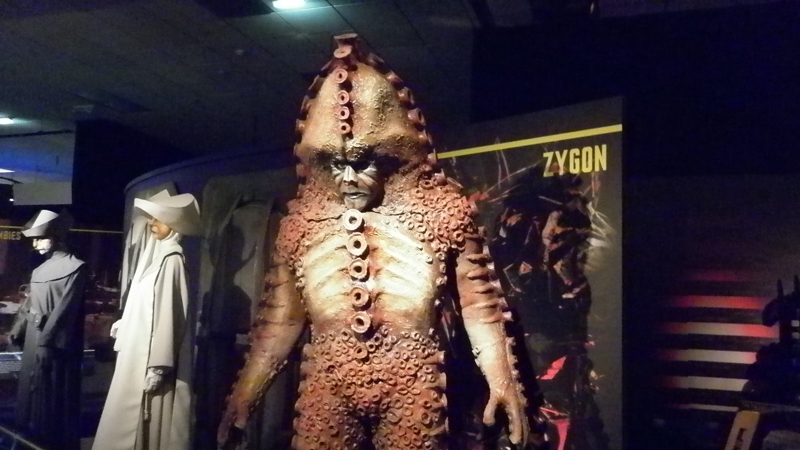 All the costumes of the various Doctors are there (although some are clearly not the originals). 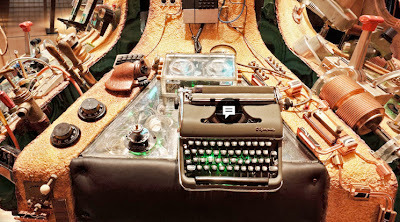 There are two full size Tardis’s – the Matt Smith one, and also the 70’s one. 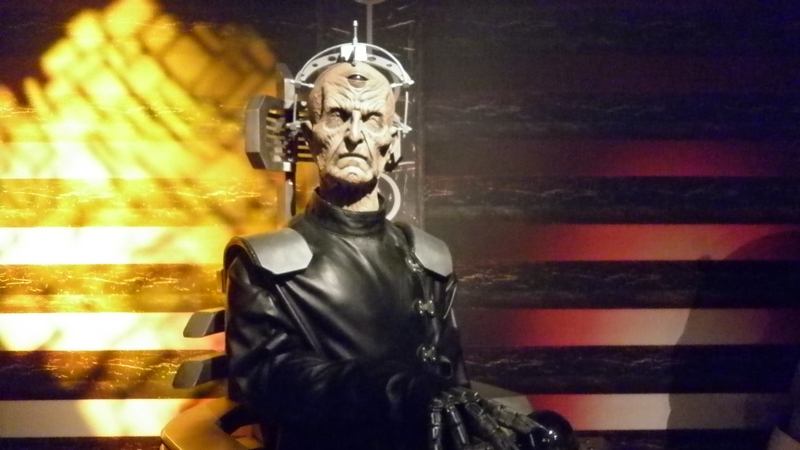 I particularly liked the set of Cybermen heads through the ages, and the Robot from Tom Baker’s first story. 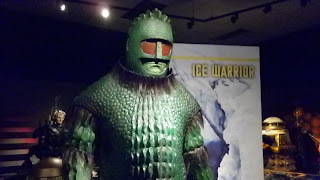 This used to be displayed at the entrance to MOMI back in the Eighties – I remember seeing it with my brother David. MOMI is still sorely missed among cinema afcionados and film students. Ignore the shop at the end, if you can (not easy, I admit if you bring the kids) – the items are over priced and can generally be bought much cheaper online. It is quite an expensive day out (I think the cottage is much better value, although more of a sedate experience!) but I guarantee that you will leave with a smile on your face. It is great to see so many ecstatic childrens faces! 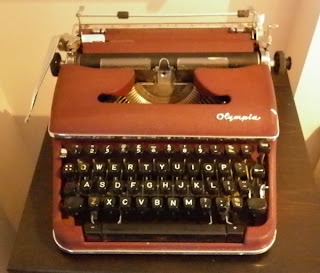 This one here, for instance…plays soothing music. I have put an extra little item of interest, for visitors, in the Apple Barn bedroom. 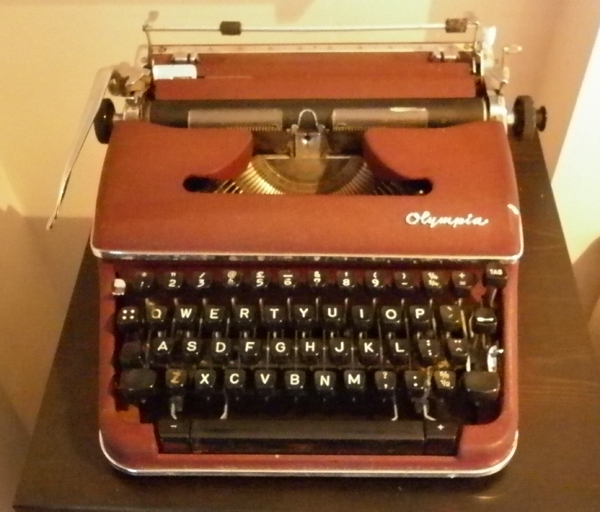 This typewriter has been in the family for over 60 years – my father brought it back from Germany with him after doing his national service there. 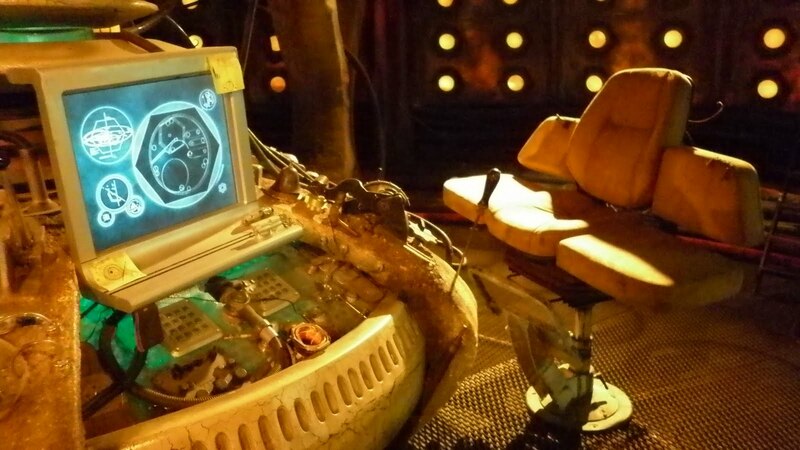 By coincidence it is almost exactly the same model used on the eleventh doctor’s tardis console! Guests are advised not to touch any of the keys – in case it makes the Apple Barn dematerialise! Can’t you sound more like a Dalek? 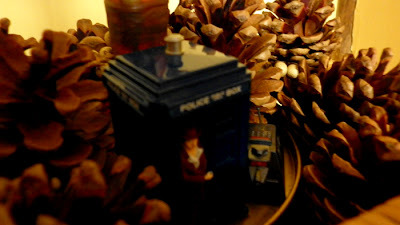 More Dalek fun for Christmas! 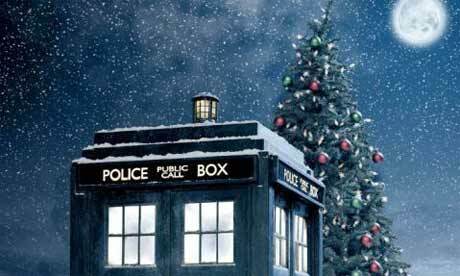 Perhaps one of the first parodies from Doctor Who was a song released the first Christmas after The Daleks was initially broadcast. 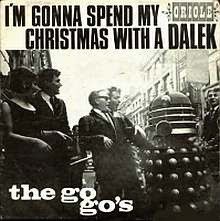 The British Go-Go’s best-selling Christmas novelty single makes them sound more like K9, and was originally released as one of the many products fueling Dalekmania. what’s a tree like you doing in a place like this? We have gone for a minimalist Christmas tree for the cottage – but it does look pretty with all the lights going through different colours! At the base of the tree, of course, is the Fourth Doctor and K9 coming out of the tardis to have a look! 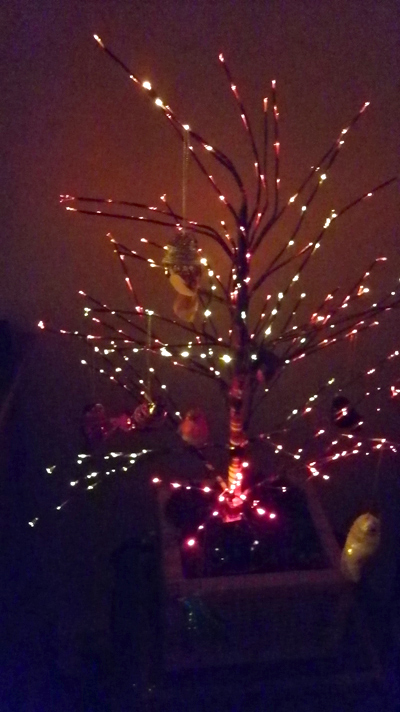 Here, is a little video I found on YouTube of a dalek attacking a Christmas tree! Shearman wrote the television episode ‘Dalek’ for the first series of the new version of Doctor Who in 2005. Before that, however, he wrote several audio plays for Big Finish , The Holy Terror, The Chimes of Midnight and Jubilee all winning best audio drama in the Doctor Who Magazine polls of their respective years. 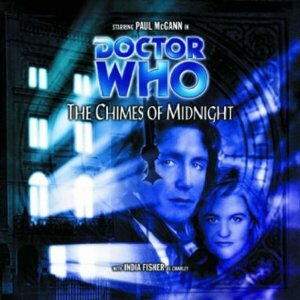 This is a very atmospheric piece that starts, seemingly, as a ‘whodunnit’ but soon develops into a rather ghostly and creepy tale which leads the Doctor and his companion into questioning their own sanity. A perfect Christmas winter tale for the fireside! 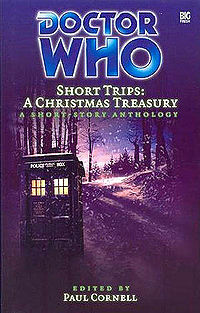 The Big Finish Short Trips were a collection of short story anthologies published by Big Finish beginning with the collection Short Trips: Zodiac in December 2002 and ending with the loss of their license in 2009. All a splendid read with a glass of mulled wine! Sadly, because they are no longer in print they can be ridiculously expensive on Amazon.